Summer Queen, a slot game made by Novomatic that brings the best season of the year straight onto your screen! The Summer Queen is the most beautiful woman you’ve ever seen and she not only has the ability to make all the flowers bloom, but she also helps you on your journey to getting those big wins you’ve been dreaming of! This 5-reel, 40-payline slot is just like the season it was named after: bright, colourful and full of life. This game has plenty of standard Novomatic features as well as some extra special ones, including free spins and stacked wilds. Players who enjoy other Novomatic games, like Mermaid’s Pearl and Dolphin’s Pearl Deluxe will very much like playing Summer Queen, the uncrowned Queen of Novomatic slots, as will any beginner player who wants a fun game that isn’t too complicated. There are plenty of unique symbols in this dazzling slot game, some of which pay more than others or have extra special functions! The lower-paying symbols are the card value symbols and these reflect the colours of some of summer’s most beautiful flowers! There is: the geranium-pink 10; the hydrangea-blue Jack; the chrysanthemum-green Queen; the rose-red King and the sunflower-yellow Ace! The higher-paying symbols are beautiful, summer-loving animals. In ascending order, there are exotic birds: the blue and yellow parrot and the black, white and orange toucan. Then there is the predator and the prey: the striped zebra and the majestic, yet deadly, lioness. Finally, there is the Summer Queen herself, in all of her glory and make-up! 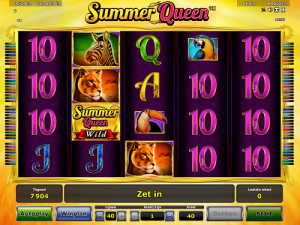 The aim of the game in this summer-ific slot game is to spin at least three identical symbols on one of Summer Queen’s 40 paylines (or however many paylines you choose to have active). The matching symbols will need to fall on consecutive reels from the left to the right and payouts will be calculated based on your bet and the value of the matching symbol, both of which will be displayed at the bottom of the screen. You can change your bet by increasing or decreasing the amount you want to bet on each active payline, and you can then have a look at the paytable to see how much each combination of symbols will pay you according to your current bet. You can choose to bet on just one of this slot’s paylines, or any number up to all forty, which of course will make your total bet the number of paylines active multiplied by your bet per line. There are two extra symbols in Summer Queen slot game that do weird and wonderful things! The Summer Queen Wild symbol can appear anywhere on reels 2, 3 and 4 and can substitute for any other symbol, except the Scatter symbol. The Scatter symbol is a crystal ball and if you spin three or more of these symbols, you’ll be gifted with 10 free games! During these free games, one symbol will be chosen as the special stacked symbol which will appear on the reels (and potentially cover several reels) during the free games to give you big wins, mega wins and even sometimes super mega wins! Summer Queen slot game can be played for free and for real money online! It has the classic Novomatic casino gamble feature which allows players to potentially double their wins by guessing correctly the colour of the next card. You can also play Summer Queen in autoplay mode, too, and let the reels spin themselves for you, without making any effort at all. Players who enjoy Summer Queen should also check out NovomaticCasino.co.uk’s Novomatic Table Games and Novomatic Live Casino Games, like Blackjack, Baccarat and Roulette.